You can network just about anywhere. (Really!) The important thing is to dress for the occasion. If you are going to an industry conference, make sure you respect dress codes and be professional. Depending on your industry – that can change. As a result, people in the entertainment and hospitality fields will be different than the financial industry. Because you never know who you are going to meet, you should always know your audience. Have you ever been in a conversation where the other person just—won’t—stop—talking about themselves? It’s annoying, right? Trying to oversell yourself and not being interested in what the other person has to say can make a really bad impression. I have to confess, that was me in my early years of networking – it was rather catastrophic. (My Goodness, what was I thinking in my early 20’s!). I learned the hard way. You can make a brief pitch and describe who you are and what you do… (But know when to stop talking!). Whether you are at a professional event or a more casual gathering, ALWAYS respect other people’s time. Yes, there may be that one person you have always admired and are SO EXCITED to meet, but know they are not there just for YOU. It’s okay to introduce yourself and have a brief conversation (where you can make a GREAT impression), but don’t stalk them or stay too long. That can definitely turn people off! When you meet someone new, often you only have a few minutes (Therefore, you gotta be sharp and quick). You can give an awesome first impression, but you want to have a way for them to learn more about you later. (hopefully they will want to!) Having a business card with contact information is a good idea, but also be prepared with a powerful LinkedIn profile. This online business platform is booming! Tell them you are on there — and ask them if you can connect before the conversation is over. But do not insist if the person doesn’t show much interest in connecting with you on LinkedIn or if he doesn’t feel like giving you his business card – in such case simply offer yours. A little “slip-up” can really stick with you. Sometimes, the simplest things can ruin your credibility. If you are at a big networking event open doors for people (don’t let a big glass door slam behind you), help someone carry their display materials (if it looks like they need help), don’t talk with your mouth full of food (YUK! ), and don’t drink too much alcohol because you’re nervous. The list goes on and on (don’t talk or laugh too loud, no inside jokes, no cursing, another important one: no chewing gum…). In conclusion, watch your manners and make your Mama PROUD. 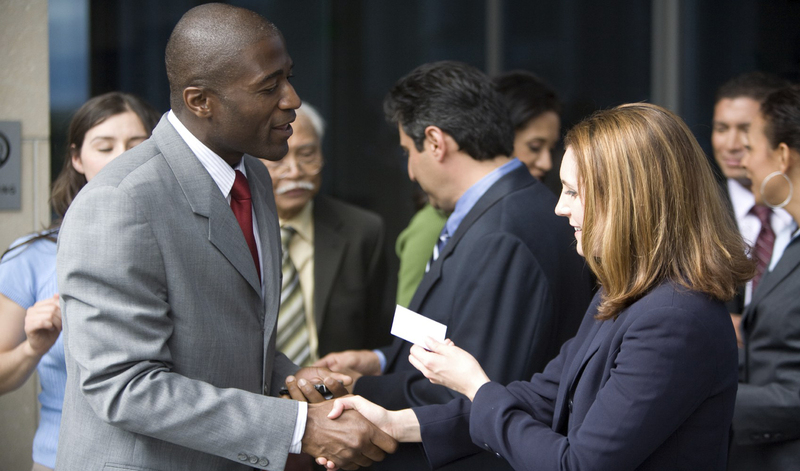 When you are networking, you want to always present your unique value before you ask people for something. What is it that you can offer that will help them? Providing value before you ask a favor or solicit business will present you as a respectable business person. Whether it is new information, connections of your own that you can share or even a sample of a product or service, GIVE before you ask to RECEIVE. Organization is very important for effective networking. Have you practiced your “elevator speech?” If you are doing a presentation, do you have your (1) laptop (2) charger (3) hard copies of your presentation (4) product samples (5) briefcase (6) bottled water in case you start coughing (7) anything else you will use that day. Make a checklist! Being prepared is KEY to CREDIBILITY. Yes – networking can be nerve wracking! It can be really hard! But smiling and being friendly is SO IMPORTANT to making a great first impression. Even if you are tense on the inside, have a smile on the outside. Often, people can be just as nervous as you at a big event. Honey tastes much better than sour milk – never underestimate the power of a nice and sincere smile. Let me share a small excerpt of my favorite poem about the value of a smile: “A smile costs nothing, but gives much. It enriches those who receive, without making poorer those who give. It takes but a moment, but the memory of it sometimes lasts forever…” (Author unknown). Therefore SMILE – it’s contagious! So, you’ve met all those great people, now what?? In Module 5 of FC Success Academy‘s program — we not only teach how to effectively network, but we also show you how to transform your contacts into clients or partners. We also teach proper business etiquette, how to effectively leverage your contacts, build partnerships and much more. Find out what we offer in each of our 6 separate modules here. We want to help you Network effectively, build the right business strategies for success, and most of all turn your PASSION into CASH.